GoXtra News: THE 8TH ANNUAL ALL WHITE 80’S PARTY! THE 8TH ANNUAL ALL WHITE 80’S PARTY! JOHANNESBURG, SOUTH AFRICA – It’s the season of fun in the sun and to get down to the sounds of SA’s hottest talented stars. Festivities are in full swing and the annual “All White 80’s Party” is no exception. On 16 December 2015, North West will come alive as what is dubbed to be one of the biggest parties to hit the town returns. Big Daddy 24/7 Events Presents: The 8th Annual All White 80’s Party which will set the tone for the year ahead at Trim Park in Potchefstroom. The show which is in its eighth instalment is known for bringing top music acts to the people and leaving them with musical memories that will resonate with them until the next anticipated show. Big Daddy 24/7 Events which is run by two business men who mean business when it comes to entertainment, respectively Daddy Masilo and Big Daddy Sekgaile will shine the spotlight on, Potchefstroom. 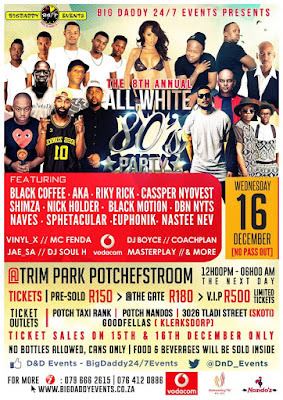 The star studded event boasts headline entertainment from the likes of world renowned DJ and producer, Black Coffee, Nick Holder, Black Motion, AKA, Cassper Nyovest, Riky Rick, Euphonik, Shimza, Naves, Sphetacular, Dbn Nyts and Nastee Nev.
“It’s that time of the year once again when all roads will be leading to Potchefstroom’s Trim Park for the 8TH Annual All White 80’s Party. The festival started eight years ago with only two popular DJ’s Cleo and Christos, today it has grown to be one of the biggest prime events for the North West Province. 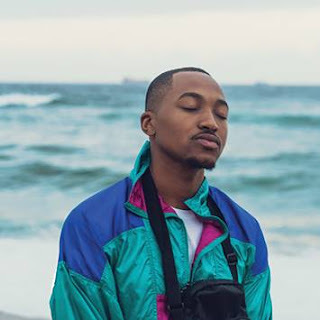 This year we are taking the event to great heights with a great line up filled with top and SA’s most loved DJs, Musicians and Rappers,” said Big Daddy 24/7 Events founder, Daddy Masilo. Ticket sales are R150 pre-sold, R180 at the door and R500 VIP. Please note that the tickets are ONLY available on the 15th and 16th December at the following outlets: Potch Taxi Rank, Potch Nandos, 3026 Tladi Street in Skoti and Goodfellas Nite Club in Klerksdorp. Gates open from 12pm until 6am, no bottles are allowed and, food and beverages will be sold at the venue.